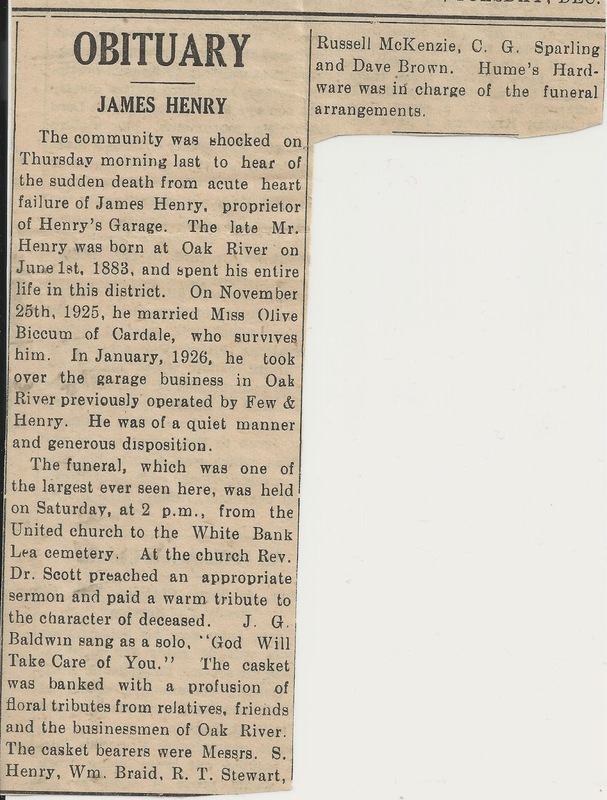 My great uncle, James Henry was born on June 1, 1883 to a single mother, Elizabeth Henry (later Sinclair). She had arrived to Blanshard from Perth County, Ontario the year before he was born, along with her mother Mary and 10 siblings. I can only imagine the scandal and heartbreak this must have caused for her to have an raise this son out of wedlock in those times, but the practical people that I think they were just went ahead and made the best of it. 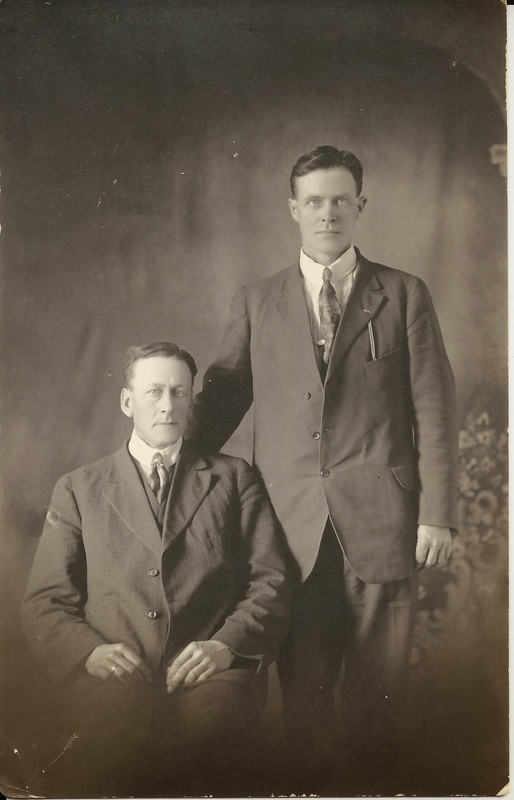 When this James was 7 years old, his mother married another James, James Sinclair in 1890, a neighbour farmer. 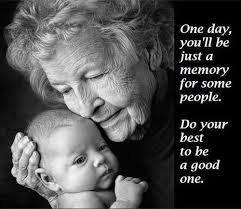 The couple went on to have 7 children, including my grandmother, Mary. Blog posts have already been created for William, Alexander, Elizabeth, Jeannie, and Ellen. Jeannie's husband Stan Fortune is standing beside "Jimmie" in the picture above on the right. The youngest of the Sinclair children was 17 years younger than him and my grandmother Mary was 8 years younger. Canadian Census documents from 1901 - 1916 show James living and working on the Sinclair farm at 16- 14- 22 with the family and hired men. He went to school at White Bank Lea school as the one near the Sinclair farm called Bankburn did not open until 1901. 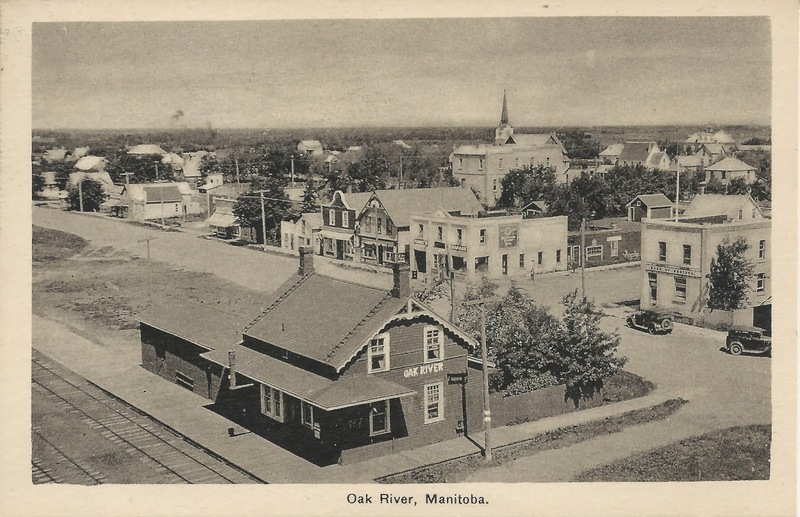 At the age of 42, James married Olive Biccum of Cardale, MB at Brandon, Manitoba. 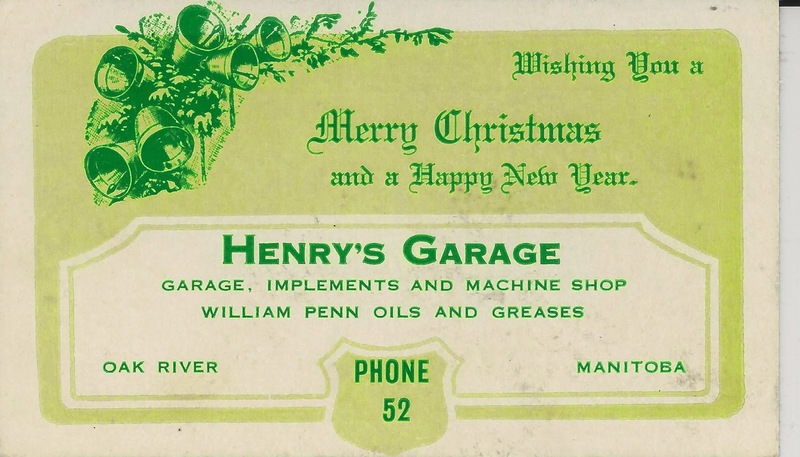 In 1926, James bought the local garage in Oak River and the Christmas business card above was saved with Aunt Lizzie's special memories. Phone 52 is a reminder of the days before 7 and now 10 digit phone numbers! The garage he owned is McCallums' Garage in Oak River today. It can be seen in the middle of this old postcard, the light coloured two story brick building. 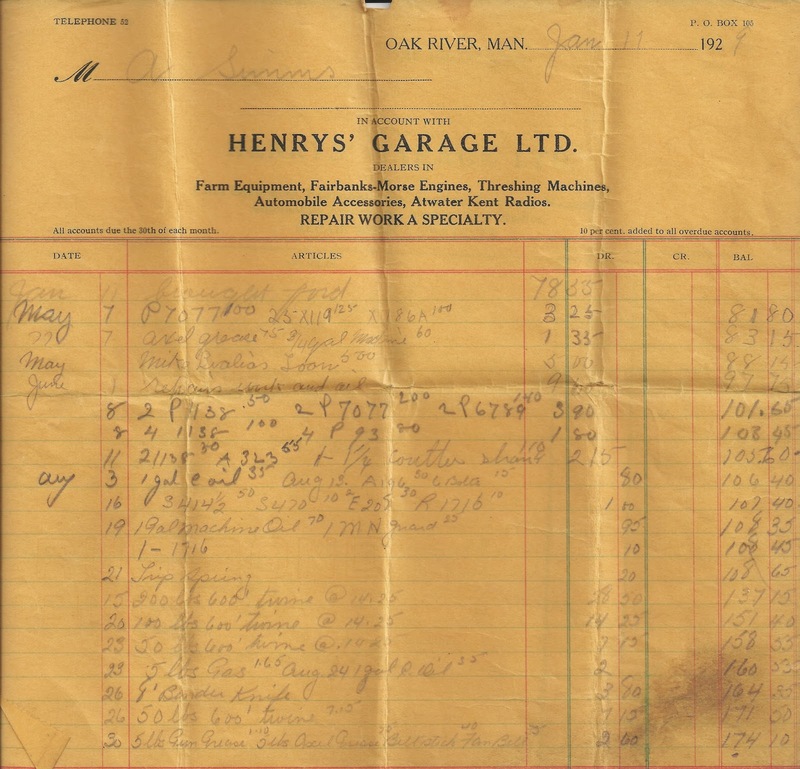 Upon enlarging the photo, it seems to say "Henry's" on the left and "Garage" on the right, which certianly helps to date the postcard. This is an account ledger for James' brother-in-law, Alex Simms, from 1929. It bills out services and parts such as on August 15 - 200 lbs. 600' twine for $28.50 and from Aug 23 - 5lbs. gas $1.65 and 1 gal. oil $0..35. On June 1 there was repair work and oil for $9.60. One wonders how many hours worth of repairs that was? 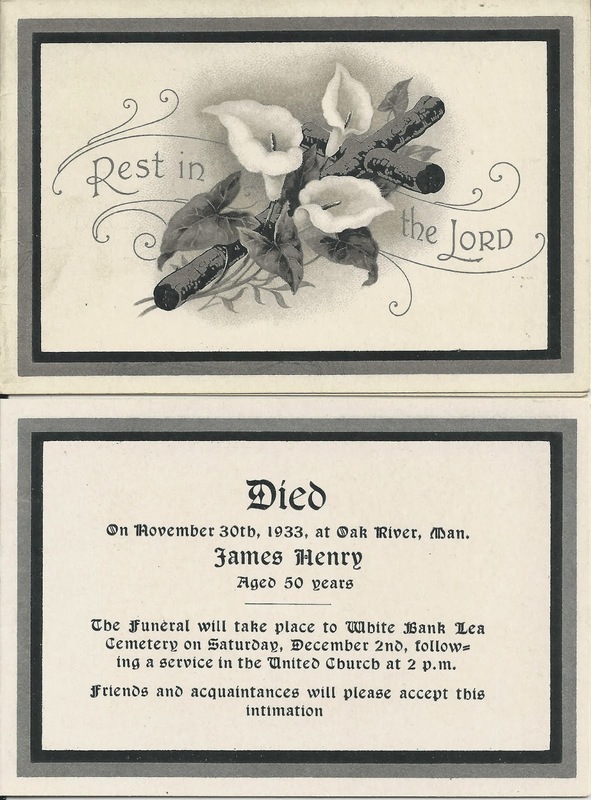 He sadly died at the young age of 50 in 1933 as the obituary and funeral card above state. Another time Mum and I were picking saskatoons in the Cleaver bluff. I again ate too much and so in town that night, they were thrown up in front of the garage (now McCallum’s). I beat a hasty retreat to our Model T parked on the east side. Uncle Jimmy came out with a pail of water and a broom and brushed it all away.